Herbalife, (NYSE:HLF) , a global nutrition company, joined with its members around the world this weekend to create a new GUINNESS WORLD RECORDS(R) achievement for most participants in a High Intensity Interval Training (HIIT) workout in 24-hours. 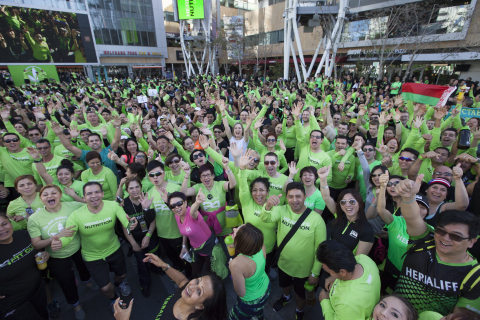 As part of the event, Herbalife and its members also created a new world record for number of people in a High Intensity Interval Training Workout in one location, with nearly 4,000 people filling the LA Live Plaza in Downtown Los Angeles. Tens of thousands of independent Herbalife members-along with their customers, friends and family-hosted workouts at local Herbalife nutrition clubs, parks and public meeting spaces across more than 80 countries. The workout began on Saturday, March 7, at 9:00 a.m. local time in Auckland, New Zealand. Throughout the next 24 hours, workout events were being held in towns and cities in every region of the globe, including in Singapore, Malaysia, Indonesia, Japan, Romania, Spain, Italy, U.K., Russia, Ukraine, Africa, Venezuela, Colombia, Brazil, Panama, Puerto Rico, Mexico, Canada and the U.S. In North America, more than 150 U.S. locations hosted workouts, with the largest workouts happening in Chicago, New York, El Paso, Miami and Los Angeles. The flagship workout took place at Herbalife’s LA Live office location in downtown Los Angeles. Herbalife director of fitness education, Samantha Clayton, lead a workout at Nokia Plaza, LA Live at 9 a.m. local time, with nearly 4,000 participants taking part. The official GUINNESS WORLD RECORDS(R) adjudicator, Mr. Michael Empric confirmed that Herbalife had successfully created a new world record for both the most participants in a High Intensity Interval Training (HIIT) workout in 24-hours, and the most participants in a High Intensity Interval Training (HIIT) workout in one location. Mr. Empric, who was present at the event in Los Angeles, stated, “It was great to be there in person to see so many excited and enthusiastic people all working out together. I was delighted to be able to confirm the record had been set and personally present the certificate to the company”. The event also served as a global fundraiser for the Herbalife Family Foundation and its Casa Herbalife Program, which supports and funds more than 100 health and nutrition programs around the world for at-risk and low-income children in underserved areas around the world. To see how the day unfolded around the world in pictures and video on social media, search for #WorldWorkout or visit WorldRecordWorkout.com. Herbalife is a global nutrition company that has been changing people’s lives with great products since 1980. Our nutrition, weight-management , energy and fitness and personal care products are available exclusively to and through dedicated Independent Herbalife Members in more than 90 countries. We are committed to addressing the global obesity epidemic by offering high-quality products, one-on-one coaching with an Herbalife Member and a community that inspires customers to live a healthy, active life. We support the Herbalife Family Foundation (HFF) and its Casa Herbalife programs to help bring good nutrition to children in need. We also sponsor more than 250 world-class athletes, teams and events around the globe, including Cristiano Ronaldo, the LA Galaxy and champions in many other sports. The company has over 7,400 employees worldwide, and its shares are traded on the New York Stock Exchange (NYSE:HLF) with net sales of $4.8 billion in 2013.